Brooklyn Nine-Nine stars Andy Samberg as Jake Peralta, a detective in Brooklyn's 99th Precinct. 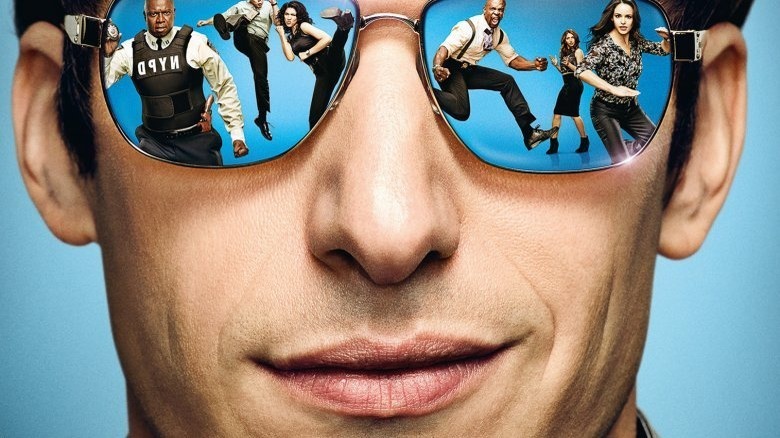 The show follows the exploits of the staff of the precinct, which also includes Andre Braugher as Captain Ray Holt, Stephanie Beatriz as Detective Rosa Diaz, Terry Crews as Detective Sergeant Terry Jeffords, Melissa Fumero as Sergeant Amy Santiago, Joe Lo Truglio as Detective Charles Boyle, Chelsea Peretti as Gina Linetti, Dirk Blocker as Detective Michael Hitchcock, and Joel McKinnon Miller as Detective Norm Scully. The show comes from from Dan Goor and Michael Schur, both formerly of Parks and Recreation. The series was never a huge ratings hit, but it was a critical success, winning two Golden Globes, including Outstanding Comedy Series, in its freshman run. The series has also earned Braugher three Emmy nominations for Outstanding Supporting Actor, and it has won two Emmys for Outstanding Stunt Coordination. Fan outcry after the show was canceled was enormous, with calls to renew the series setting it trending on Twitter. The fan outpouring was so huge that, just hours after the cancelation, multiple outlets were reportedly calling producers Universal Television to talk about picking up the series for a sixth season. The situation got dicey when Hulu and Netflix reportedly passed on the project, but NBC then swooped in, taking over the show, which they had passed on in its initial development. "Ever since we sold this show to Fox I've regretted letting it get away, and it's high time it came back to its rightful home," said Robert Greenblatt, NBC Entertainment chairman. "Mike Schur, Dan Goor, and Andy Samberg grew up on NBC and we're all thrilled that one of the smartest, funniest and best-cast comedies in a long time will take its place in our comedy lineup. I speak for everyone at NBC, here's to the Nine-Nine!" The movie is a smart one, considering the fact that NBC owns Universal Television. The network is also already home to Schur's comedy The Good Place, and the prolific creator already has another show, the multicam comedy Abby's, set up there for next season. Fox also handed down cancelations this season to Fox's The Mick and The Last Man on Earth; both of those comedies were also reportedly being shopped elsewhere, although a pick-up for them seems less likely. You can view the reactions of some of the cast and crew to the renewal below. SQUAD YOU DID IT #BROOKLYN99 WILL BE ON NBC FOR OUR 6th SEASON! Thank you to everyone for the crazy outpouring of support. It means the world to us. It wouldn't have happened without you.